March 25, 1992 will always be remembered as one of the most glorious days in the history of Pakistan cricket. It was on this day, at the Melbourne Cricket Ground, that Imran Khan’s ‘cornered tigers’ completed their fairytale journey at the cricket world cup. Wasim Akram’s magic, Ramiz Raja’s flight of victory, Aamir Sohail’s sajda, Imran Khan’s controversial speech are the various moments that spring to mind when one recollects the magical 22-run win. What is your favourite moment from the final? Where did you watch it? Did you think Pakistan would be able to pull it off? Who was your player of the match? I was in 4th class and heard that Inzamam ul Haq played brilliant in semi’s and I was used to live in small village and then its was second inning and England was playing when Wasim Akram took two wickets consecutively I heard a noise from next home to us, I ran down there and I remembered the last over only when Imran khan got last wicket and got a world cup and his presentation ceremony when he spoke thanks to English team and it was my dream that I full filled today. That what I got inspiration from him and nothing is impossible. Player of the match surely Wasim Akram he took approx. 14 wickets and played sensational in the semi and final. Even though i was only 5 years old and could’nt tell what was going on, why is everybody jumping and screaming around me but i knew one thing for sure that we have won world cup against England. Later on when i get to see all the recordings and moments of world cup ’92 i was amused by it and could feel the similar feels that people had when Pakistan won that worldcup. Wasim Akram’s 2 wickets was the best moment in that match. The song, the stadiums, the crowd, the colored kits….the atmosphere. Everything was absolutely outstanding!! It has to be the final. We were all thinking of bunking school that day but the head mistress strictly forbade it. Some of us who took it seriously were miserable throughout the day as we were being deprived to watch the live action. But lo and behold! We came to know about a kid in grade 2(or 1) who had brought a black and white mini tv. Now, the “senior” classes (grades 9) couldn’t have that, would we? We ‘borrowed’ it from him in time to watch the end of the first innings. And of course going home to watch the rest of it live, those absolute beauties from Wasim Akram to start it all. Here’s wishing we don’t wait too long for that to happen again. The theme song was fantastic. We had our Metric board exams during the entire world cup. On 25th of March it was the final Biology practical. I remember every one appearing in the exam, including the examiner, were least concerned about the Practical. When Pakistan took the early wickets the examiner was really happy and gave us all very good marks. Next day the National papers were full of headlines such as ‘Pakistan Rules the world’. I will never forget that. i was some what 9 years old when my dad and uncle jumped out side the street shouting with the slogan pakistan zindabad with their radio on full volume describing the fall of lewis…….. The Worlds is coming down the Flags are Up who’s going to Take up the Cup Whose going to Be Number one. This song was on every Pakistani’s mind & mouth. They sang this song even if they did not know to speak English. If I am not mistaken we were at the mercy of the West Indies and Australia Match. Had Australia won we would have never qualified for semis….. Thanks to Lara……..
Can’t afford to Forget Inzi’s classic innings against Newzealand in the semis and the inswinging Yorkers by Wasim……Thanks to Imran if he wouldn’t be hitting hard on Wasim this would never happen……. Still at the end of the Day we fought our way to the final and won it. Ken, you have got it wrong. Australia had to beat West Indies to let Pakistan through to the semis, and that’s exactly what happened. It was Australia who beat West Indies and not the other way round. Rehan Sohail, you are correct in stating that West Indies had to beat Australia. If I am correct, the Windies were well on the way to victory, but an inexplicable run out of Winston Benjamin (I think) made sure that Windies lost and Pakistan waltzed through to the Semis. In step Inzimam who mullered NZ to all parts of the ground and then the rest is history…………. However I must say that Beefy Botham was never out but hey! 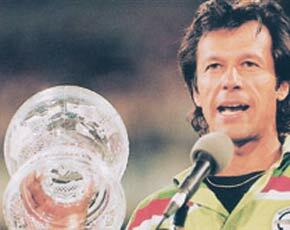 Who cares he got a duck and Pakistan were crowned Champions………..
It’s the best memory I have from the 90’s. Fortunately my class 7th final exams had ended by then, so me and my brother watched the whole match. It was Ramadhan and the match ended just before Iftar. Immediately people started celebrating with the noise of fire crackers coming from the street. The only disappointment was Imran Khan’s speech at the end, but he can be forgiven for it, considering the strain he was in. It’s not easy leading a team of usually indisciplined, but talented Pakistani cricketers, and molding them into a fighting unit. No one single person can be given the credit. Javed Miandad, Aamir Sohail, Mushtaq Ahmed, Aqib Javed and Inzimam all played well. Moin Khan wasn’t really good behind the wickets but he redeemed himself through his innings in the semi final. Inzimam can be credited with keeping Pakistan’s hopes alive. I remember before he came to the crease, it seemed that Pakistan’s World Cup campaign was over. But he miraculously turned around the game for Pakistan, though it was Miandad and Moin who saw Pakistan through. Wasim Akram’s spell in the final is unforgettable; his brilliance at the critical moment was awe inspiring. A great player is one who can deliver when it matters the most. But credit must be given to Imran Khan. He was the anchor for the team, he was the one made the decision of when to bring in Wasim Akram, and he kept the team motivated. What he could not do with the ball, he did with his astute captaincy. He truly deserves the title of Great. No one man can make a team win in cricket, but you have to wonder whether it would have been possible without him as captain. The final is an unforgettable moment for every Pakistani who saw that match. It was the finest hour of Pakistan in sport. And it’s the golden moment itched into my memory. Aamir Sohail telling Ian Botham to send his “Mother-in-law” after his dismissal against Pakistan. It was in response to an earlier comment by Botham against touring Pakistan, saying he would rather send his mother-in-law. I was in school and our lady principle despite all the request asked us to attend on that day, as she herself haven’t had any clue what was going on, then Pakistani govt. announced the public day off, I still remember riding back on my cycle from school with madness, I fell and injured my knee badly but stood up and rode the cycle again to home in excitement, somehow we knew we will win, Allah was with us and the victory was already ours, still remember Wasim Akram taking those two wickets with in-swinging balls, I jumped and screamed in joy and pain from my knee, and after Ramiz Raja took that last catch I limped out on street and danced with my friends, no wonder I spent next 10 days on bed with pain killers. In my opinion Javed Miandad was the difference especially in the semi final and the final. Although, everyone played beautifully and Pakistan team were the underdogs. I remember the whole nation was praying for other teams to lose so that Pakistan could progress. I think golden moments was Pakistan lost 6 wicket for 60 odd runs against England round robin match, then due to heavy rain, both team got 1 point each. So Pakistan can enter to next round an won the world cup final. Not trying to be political but We again need nationalist approach, Love Pakistani and be Pakistani!! Without supporting any politics in the game of Cricket ! ONE – United Pakistani Cricket Team – Working together to succeed. Pakistan rose from almost the bottom to win the 1992 World Cup. I was in Rawalpindi at home. A splendid team effort, execellent bowling by Wasim at the needed time, but the main credit in my opinoin goes to IMRAN KHAN who instilled the spirit in his team that had not have fared well in openning matches. he got the team together and gave the nation a splendid gift thanks to ALLAH, THE ALMIGHTY. The semi final againt New Zealand was also a very nevre testing match. will we win the twenty20 been played in west indies;we need a team like the one lead by imran khan. I still remember. I don’t I ever prayed as much as I did that day for Pakistan, Imran in particular. I prayed for his success because I believe the great man deserves all our support. Wasim Akram bowls to Chris Liwis and BOWLED…………………………Simply the best. What class of heroes we had at that time. Miss all of them. I agree. The ball had hit the root of the stump and it went flying in the air. Unforgettable scene! And then the unforgettable words: “Wasim Akram is on a hat-trick”. next time maybe on March 25 2092.
the match was to be at 4:00 am so, some eight of us first, got together for coffee at perkins and promptly came to our home in minnetonka and watched the game. the intensity, the excitement and the magnanimity of the event was remarkable. of course it was wasim’s two wickets that sealed the victory, richie benaud was sure also. when the match ended, we pull the curtain. the day was breaking and a dear stood right in front of our eyes, glazing away. what a remarkable event it had been. I was 18 year old and waited impatiently to watch the final at home. I still remember how dejected we were when Pakistan kept on loosing matches in early stages of World Cup. But infact it was our brave captain Imran Khan who did not loose hope . He was so confident that Pakistan will win last three matches against Australia, Srilanka and Newzealand and by winning these matches will enter the semi finals. By the blazing contribution from great players Miandad, Inzamam-ul-Haq and Moin Khan we reached finals. England through out their World Cup Campaign which started even before the World Cup began they beat kiwis in their own backyard 3-0. This was the main factor of England doing so well early robin league matches. They entered the field with high confidence. But I think it was the partnership of Imran Khan and Miandad who took off the shine from th new ball and allowed Inzamam and Akram to do the hamering of England bowlers especially Botham and Levis. Cornered tigers you made us proud on that day!